I'm taking a flight with LATAM (Buenos Aires - El Calafate, El Calafate - Ushuaia, Ushuaia - Buenos Aires) next month. It says about a carry-on baggage and its maximum dimensions and weight. Good. But on the last line it says that one may also take one personal item under the seat. Does this mean that I can take two carry-on baggages? YES. It means exactly what it says. The carry-on (suitcase) case must meet those dimensions in order to fit in the overhead bins. You may also bring another item but it must fit completely under the seat in front of you. If you're pushing the envelop on size, the Gate Agents and/or Flight Attendants are the final judge on 'fit'. There's no point in arguing with them. (For the nitpickers, if the bag does fit in the sizer, I have never seen a Agent still make the passenger check the bag. Similarly, if the overhead latches, I have never seen a Flight Attendant require a bag to be stowed elsewhere or be checked). Meaning, one item in the overhead and one item under the seat in front of you. If you have a bulkhead seat, you may place the personal item in the overhead as well. I live in Argentina and I travel a lot with Latam. 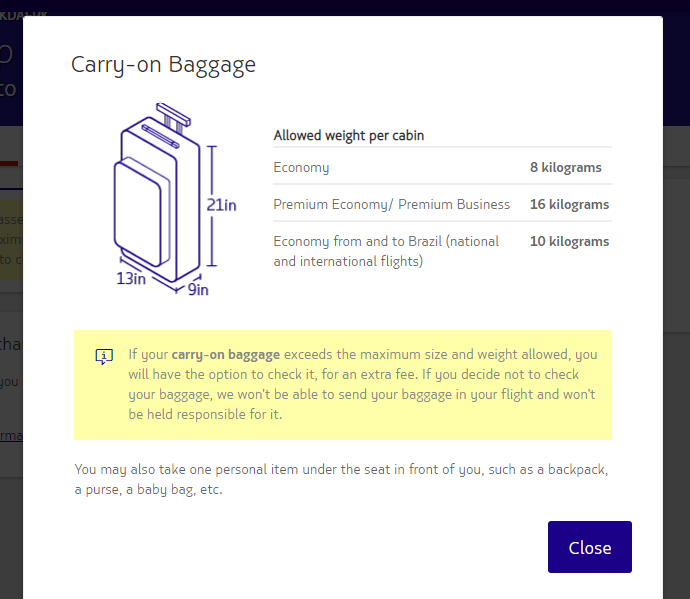 After some recent changes on fare tickets on South America, people get very low prices if they travel with cabin luggage only. This means that the carry-on suitcase number increased by 100%. A plane has limited space for carry-on suitcases stored in the overhead. So now, Latam personnel controls carry-on suitcases (size and weight) at the gates while passengers are boarding the plane. You may get your suitcase (or big bag) not matching the size being checked. They might or might not apply extra charges. Even if your carry-on matches the size and the max. weight, if there's no space for it overhead they will check it. On these cases, they will not charge you. This applies at least to Argentina, Chile, and Peru. Not sure if Brazil has the same problem. As additional advice, I suggest you put a plastic bag on the top of your carry-on. If they decide to check this suitcase, you can quickly recover and keep with you any valuable stuff (either expensive, fragile or priority use). Not the answer you're looking for? Browse other questions tagged air-travel luggage airlines hand-luggage argentina or ask your own question. Does easyJet allow a “personal item”? How many luggage are allowed in international flights and what should be their maximum weights and dimensions?